Your bedroom may be a more hazardous place than you think. Find out what in your bedroom could be making you sick without you even realizing. Our bedding, especially our pillows, can quickly accumulate sweat, saliva, skin flakes, and other bodily excretions, as well as bacteria, mold spores, or dust mites. All of these substances can cause allergy-like symptoms including scratchy eyes, headaches, and sore throat. It is important to change bed sheets regularly, ideally once a week. Also, aim to change pillowcase covers once every few days, and wash pillows once a month if possible. If you have a pillow that can’t go in the wash, replace it every 12 months. If you’ve been suffering from symptoms like dry skin, sore throat, or congestion, running a humidifier in your bedroom may be a good idea. Moisture in the air can help relieve many health issues, but can unfortunately also cause some problems if the humidifier is not maintained properly. When not cleaned between each use, mold can build up on the inside of the machine. That mold then gets released into the air when the humidifier runs. Ironically, this can cause many of the same symptoms that humidifiers are meant to relieve in the first place. There are more man-made chemicals out there in commercial cleaning products than ever before, and over 6,000 new chemicals are being introduced each year. Many have not been tested for human safety, and a great deal are known to irritate those with chemical sensitivities. Exposure to certain household cleaning products can cause itchy eyes, runny nose, and headaches. It is better to avoid these products, especially in the bedroom, and opt for natural or homemade cleaners instead. Vacuums are meant to pick up dust, animal hair, and other fine particles. Ironically, many end up pushing all those things back into the air. Non-HEPA vacuums don’t have a barrier to hold all the fine particulates and volatile organic particles (VOC’s) in, and they just dissipate into the surrounding areas, sometimes in a more concentrated form than they were in the first place. Vacuum cleaners with specially designed HEPA or similar filters work best to minimize this effect. Carpeting, especially new carpeting, contains a great deal of man-made chemicals. New carpet can off-gas, or emit chemicals into the air, for weeks after it is installed. If not cleaned properly, carpet can also hold on to allergens like pollen, animal fur, or chemicals, as well as harbor insects like fleas or even bed bugs. Carpet is nice but is not the best choice if you are trying to avoid irritants or allergens in the bedroom. Alternative flooring, like hardwood or vinyl, is better. Candles usually contain a host of unnatural chemicals and fragrances. When burned, these chemicals are released into the air, and can really affect those with chemical or fragrance sensitivities. Candles with natural ingredients are better, but you are best off if you avoid candles altogether if trying to maintain a nontoxic bedroom environment. Plants can actually be a good thing in the bedroom if they are cared for properly. They can become a problem, however, if maintenance is done incorrectly—if they are overwatered, mold can begin to form on the soil and pot, and be released into the air. For those with respiratory problems like asthma, this can create a real problem. Make sure plants are watered only when the soil is visibly dry. Pet hair can aggravate allergies or allergy-like symptoms in many individuals. Even if pet hair doesn’t usually bother you, it can create problems if your cat or dog is sharing a bed with you every night. To avoid this problem, dogs and cats should sleep outside of the bedroom, or at the very least, on the floor in a separate area. Studies have shown that in most homes and businesses, indoor air is far worse than outdoor air in terms of pollution—up to 5 times worse! If windows are left closed, they allow the already toxic air inside to recirculate and become more concentrated over time. It is a good idea to leave bedroom windows open often to encourage ventilation and dilution with outside air. We spent a lot of our lives on a mattress. Mattresses can build up sweat, skin flakes, and other bodily substances. Since mattresses are not easily washed, many people go years without cleaning theirs, and this contamination multiplies. Mattresses are therefore often full of bacteria, allergy-causing dust mites, and other potentially harmful substances. To extend the life of your mattress and counteract this problem, you should use a natural, allergen-free, waterproof mattress cover that you can remove and wash regularly. In each case above, some tips were given on how to combat some of these bedroom toxins. The reality is that some of these toxins are still going to be there, despite taking some of these measures. In addition to taking steps to get rid of some of the sources of what you know could be making you sick, a high-quality air purifying system can alleviate a lot of problems. Even if these substances are still present, an air filtration system that effectively catches many of the chemicals and allergens created by pets, chemicals, etc. can make a big difference. The best air cleaner for this purpose is one with a HEPA filter and a cartridge designed for neutralizing and removing chemical odors and VOC’s. Traditional air purifiers focus on particulate removal and do little to no chemical odor removal. 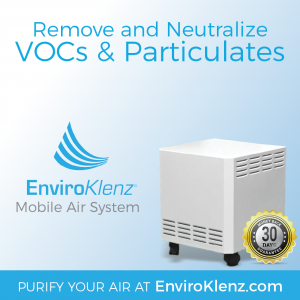 The EnviroKlenz Mobile Air System is the best HEPA air cleaner for those with allergies or chemical sensitivities. The Mobile system utilizes HEPA filters combined with its unique VOC cartridges to effectively eliminate chemicals, odors, fragrances, or allergens from the air by not only trapping them but deactivating them. It is perfect for use in the bedroom. With its three settings, you can pick the quiet lower setting for night time, and the medium or high during the day to maximize its effects. Whether one or all ten of the items on this list are a problem in your bedroom, you deserve a good nights’ rest and to feel happy and healthy in your own space. Take these measures to be on your way to a healthier sleep environment. Check out our related blog on 3 Things to Know About Your Indoor Air Quality & How It Affects Your Health !